A bright white sulphur-crested cockatoo that may have escaped its cage has found a new family in Carlsbad: a large flock of crows. Residents in a central Carlsbad neighborhood off Tamarack Avenue have spotted the striking exotic bird amid a sea of jet-black crows that stops in the area during daily flights between the coast and some inland overnight roost. Correll snapped a photo of the cockatoo perched near four or five indifferent crows on a rooftop near his home. 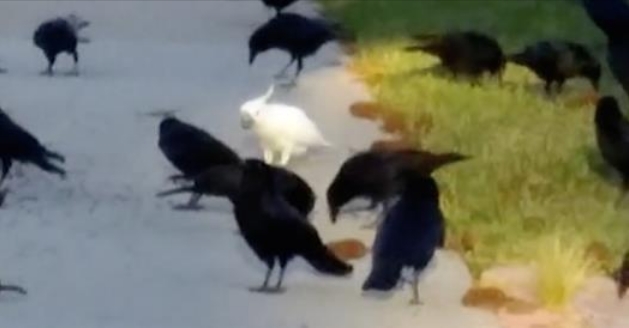 He also found a YouTube video posted in November in which an observer expresses surprise at seeing a cockatoo foraging among crows on a sidewalk a few blocks away from Correll’s house. San Diego Natural History Museum bird expert Phil Unitt said it’s not surprising that a cockatoo on the lam would take up with crows. Native to Australia and New Guinea, “the sulphur-crested cockatoo is a very gregarious species,” Unitt said. “If it escaped from its cage here, it’s not going to find any other cockatoos. Responses to "Cockatoo Adopted By A Group of Crows "
So happy to know the poor illegal alien was adopted by a tribe of native Americans. Wow that's just so cool!